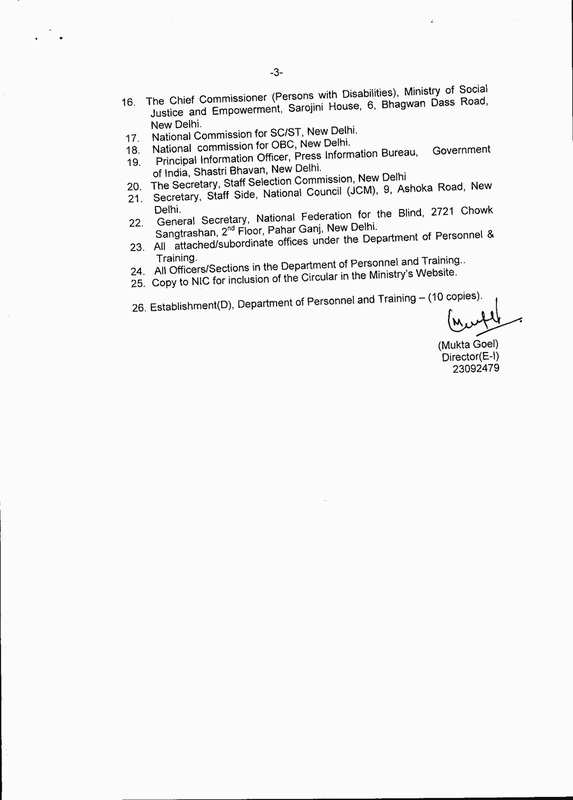 The following is the message which is published in official website of 7th pay commission…. Further to the memoranda received from a variety of Organisations, Federations, Groups representing civil employees in the Government of India as also from the Defence Services, the Commission has had fruitful and wide ranging discussions on relevant issues with all stakeholders. Such interactions have now been concluded. Valuable inputs have been received and the work of compilation and finalization of the report is underway, so that the Commission completes its task in the time frame given to it. Accordingly, any future requests for meeting with the Commission will not be entertained. 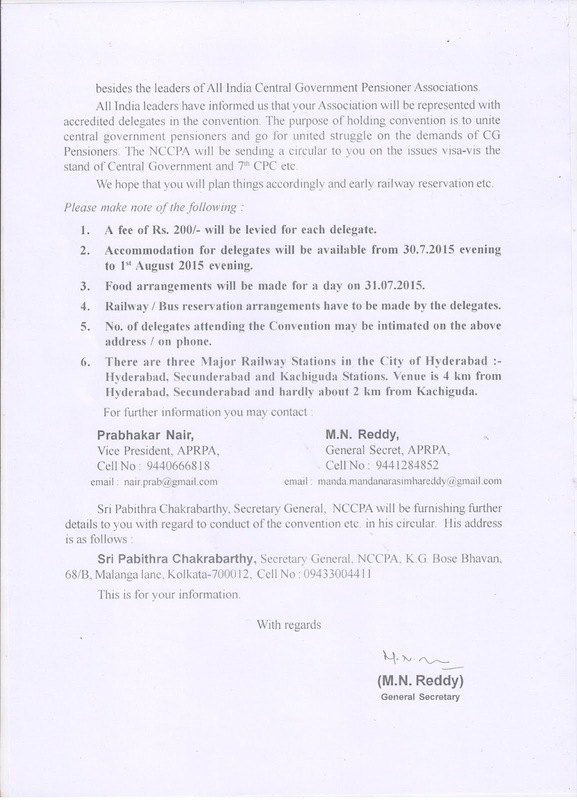 Stay arrangements are from 30th July evening to 1st August evening. 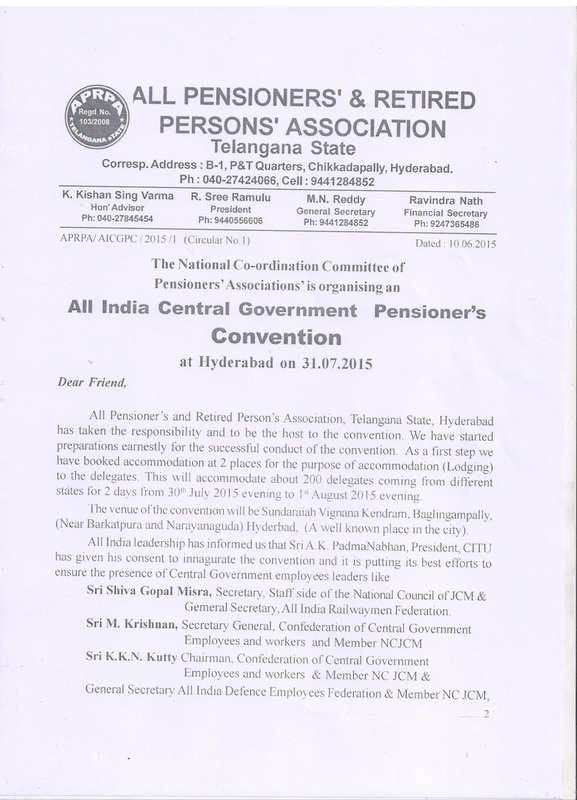 The National JCA, which met at the Staff Side Office on 8th June, 2015, took note of the fact that quite a few states are yet to hold the State Level Conventions. The meeting also noted that the strike decision taken on 28th April, 2015 has not been percolated down to the rank and file of the workers. The meeting wanted the affiliate to realize that the denial of the demand for wage revision to be effective from 01.01.2014 and the consequent denial of interim relief and the benefit of merger of DA with Pay must be viewed very seriously as the said decision will have far reaching consequence. The Government would discard the age old practice of grant of I.R. and merger of DA forever. 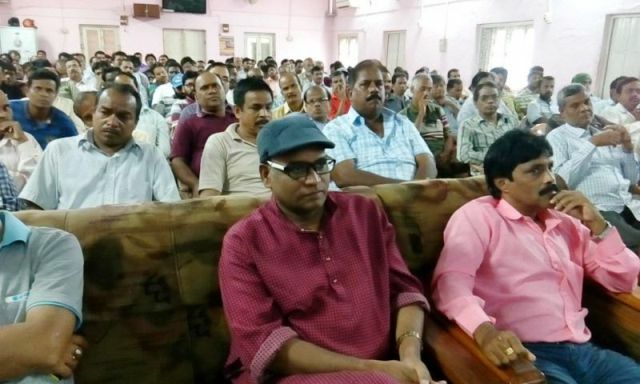 It has decided to appeal to all the affiliates to chalk out independent programmes of actions in the months to come and to carry out the same in all seriousness so that the employees become fully aware of the possible outcome of the 7th CPC. The Chairman and Convenor of the National JCA will get in touch with those States, where the convention has not been held so far. The meeting decided to convey to members that the minimum wage computation, in the given situation would be on an imaginary basis. 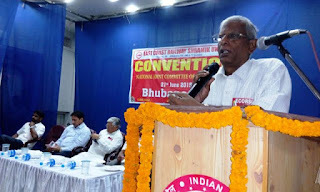 The National JCA was of the opinion that a meeting of all office bearers of the participating organizations must be convened at Delhi somewhere in the month of July to chalk out programmes of action to be pursued by the CGEs together. It was informed at the meeting that both Defence and Railways would be taking their strike ballot and would be concluded in the first week of October. The meeting, therefore, decided to advise the other units to chalk out progammes of action in July so that an ambience of struggle could be created. The NJCA also took note of the painful fact that despite assurances, Government was not convening the National Council and Departmental Councils and the JCM has been allowed to become defunct. 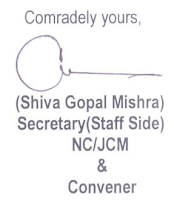 The National JCA in conclusion decided to appeal to all affiliates to take concrete steps to invigorate the joint movement of the Central Government employees and meet the challenge that is likely to arise on receipt of the recommendations of the 7th CPC by creating an atmosphere of Unity, and determination to carry out the call of indefinite strike action scheduled to commence on 23rd November, 2015..
Com. 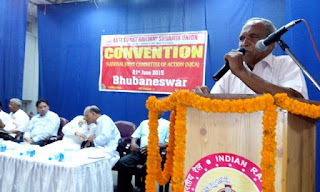 Shiv Gopal Mishra, Secretary, National Council, JCM (Staff Side), Convenor National JCA and General Secretary, AIRF addressed the joint convention of Confederation of Central Govt. 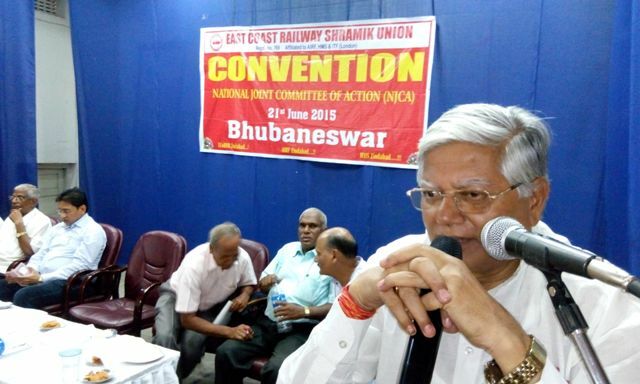 Employees and Workers and All India Railwaymen Federation at 3 P M on 21.06.2015 in Mancheswar Rly. Workshop Institute, Bhubaneswar. Odisha State branch of National JCA formed in the presence of Com. 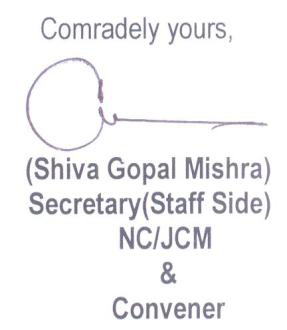 Shiv Gopal Mishra (List of office Bearers will be published later on). The following leaders also addressed the Convention. 1. Com. Nirakar Satpathy, General Secretary, East Coast Railway Shramik Union, Bhubaneswar. 2. Com. 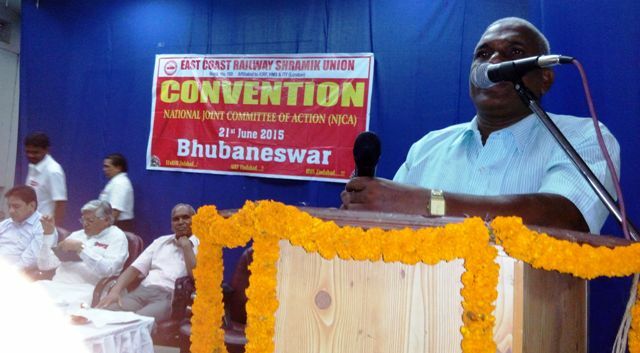 S Lawrence, General Secretary, South East Central Railwaymen Union, Bilaspur (Chhatisgarh). 3. Com. Ch. 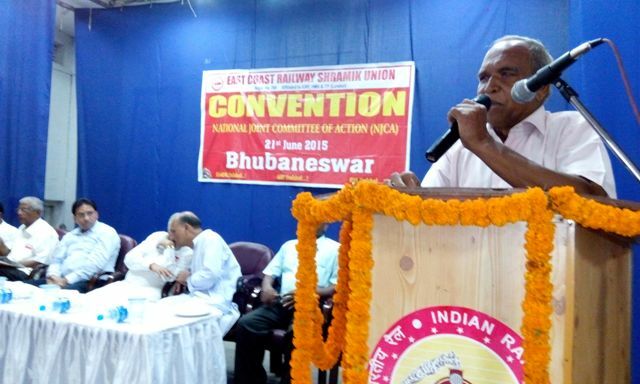 Gandhi, President, East Coast Railway Shramik Union, Bhubaneswar. 4. Com. M M Samal, President, Confederation of Central Govt. Employees and Workers, Odisha State CoC. 5. Com. R N Dhal, General Secretary, Confederation of Central Govt. 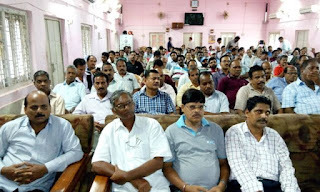 Employees and Workers, Odisha State CoC. 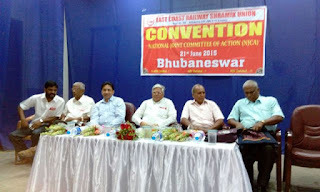 The Convention was presided by Com. 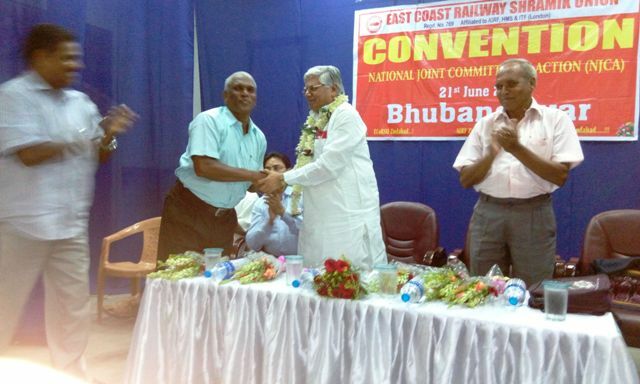 Nirakar Satpathy, General Secretary, ECoRSU and the vote of thanks was given by Com. P K Patsani, Addl. 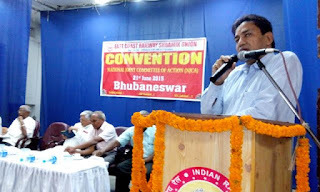 General Secretary, ECoRSU, Khurda. 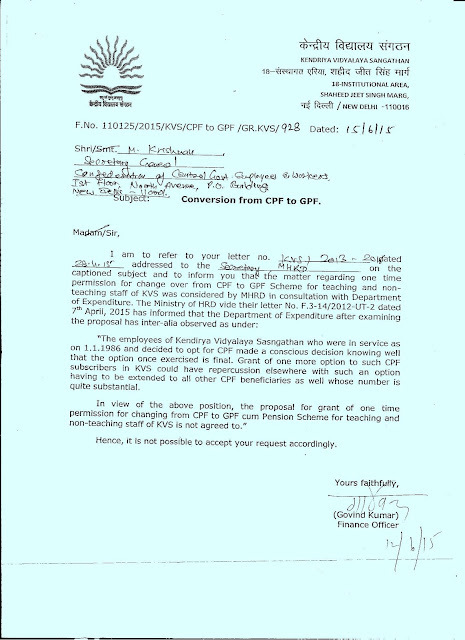 CONVERSION OF CPF TO GPF - REQUEST OF CONFEDERATION REJECTED BY FINANCE MINISTRY. 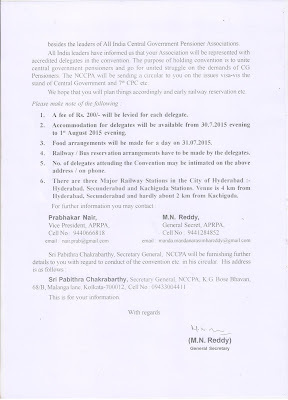 As indicated in our last circular letter, the final meeting with the 7th CPC was held on 9.6.2015. Earlier on 8th afternoon, the Staff side had met separately to chalk out the course of negotiations. The National JCA also met on the same day. The National Anomaly Committee met on 9th June, 2015 at 3.00 pm under the Chairmanship of Joint Secretary (E) Department of Personnel at Room No. 72 North Block, New Delhi. We give hereunder a brief synopsis of the discussions at all the meetings. (a) Date of effect: The Chairman has made it clear that the Commission would recommend 1.1.2016 as the date of implementation of their recommendations. The Commission would finalise its report by end of August and would submit the same to the Government thereafter. They would adopt Dr. Aykroyd formula for the computation of the Minimum wage. To the specific query made by the Staff Side, the Commission said that they would factor the probable increase in the rate of retail prices of the commodities and would arrive at the minimum wage as on 1.1.2016. There had been no reply to the loss of wages to the employees due to the erosion of the real value of wages as there was no interim relief or benefit accrued from the merger of DA. These demands, therefore, stand rejected. 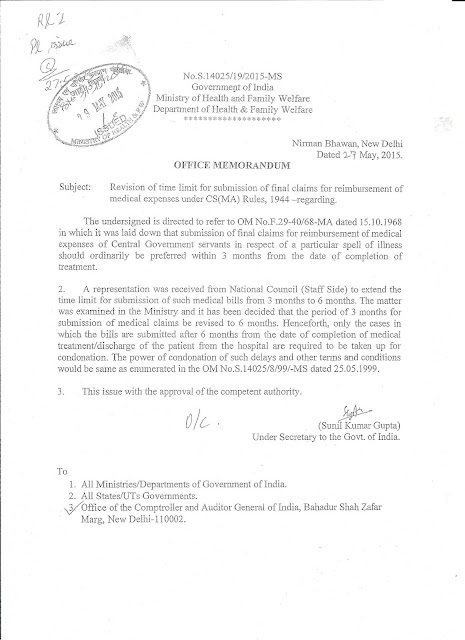 (b) Increase in the insurance coverage in cases of death in harness: The Staff Side recalled the assurance held out by the Commission earlier to have the actuarial assessed by an expert agency to accede to the demand of the staff side to increase the subscription and the insurance coverage. The Staff Side was of the opinion that their suggestion to share the subscription in the ratio of 3:7 was reasonable but in the absence of an expert study, the Government might not accept the same. The commission said that they would explore the possibility of such an assessment by the LIC before finalization of the report. (c) Fitment formula. The Commission might accept the suggestion made by the Staff Side in respect of fitment formula with requisite change in the ratio on the basis of the quantum of minimum wage determined. (d) Open ended pay scales: The Commission would recommend open ended pay scales as suggested by the Staff Side. (e) In the matters of rate of increment, quantum of allowances etc, the Commission did not come out clearly of their thinking in the matter. (f) Parity in pension entitlement of the past and present pensioners. The Commission is yet to make up its mind on the suggestion made by the staff side in the matter. They however said that almost all the Pensioners organizations which met the Commission had pleaded for this and the same is linked with the one rank one pension demand of the Armed forces personnel. (g) MACP scheme . The difficulties and anomalies pointed out by the Staff Side and various other organizations have been taken note of by the Commission. The Commission assured to evolve a methodology to resolve the problem. (h) Opposition to the induction of casual/daily rated workers and contractorisation. The Commission said that they were opposed to the unfair practice of exploitation of labour. For jobs which are of perennial and permanent character, regular workers must be recruited, the Commission added and that would obviate the need for outsourcing and contractorisation. 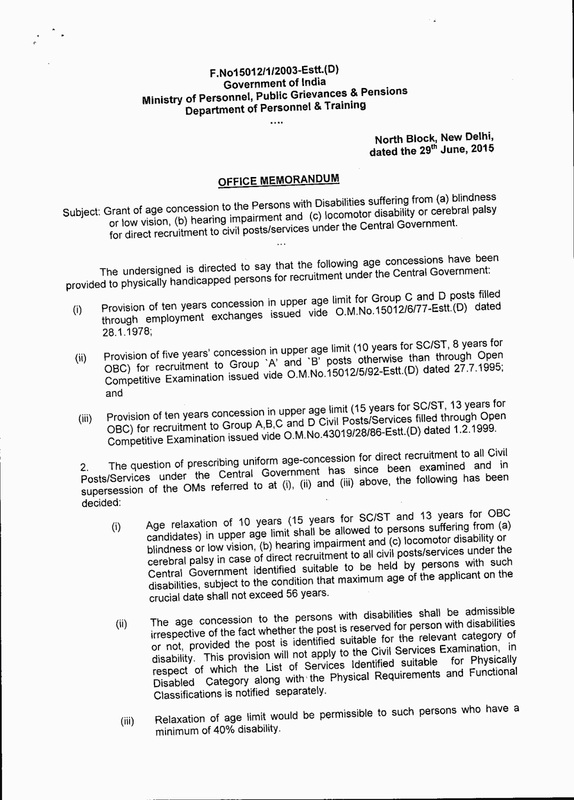 Since most of the outsourced jobs do not require any academic qualification, the Commission was of the opinion that the revival of Group D cadre would help to address the issue. However, the Commission stated that if only the staff side sends in a communication in writing, the Commission would be able to make any recommendation in the matter. 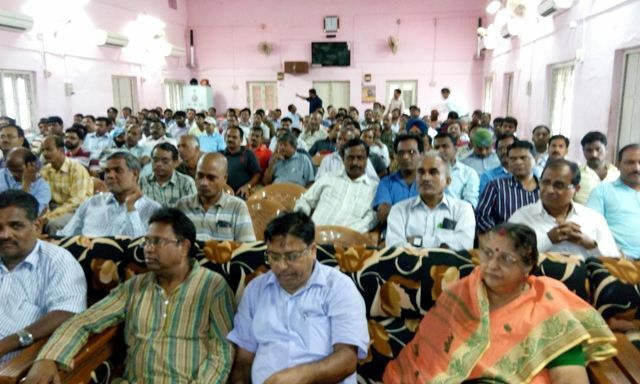 The Staff Side reiterated that they are totally opposed to outsourcing, induction of casual workers and contractorisation and the same has been made explicit in their memorandum. 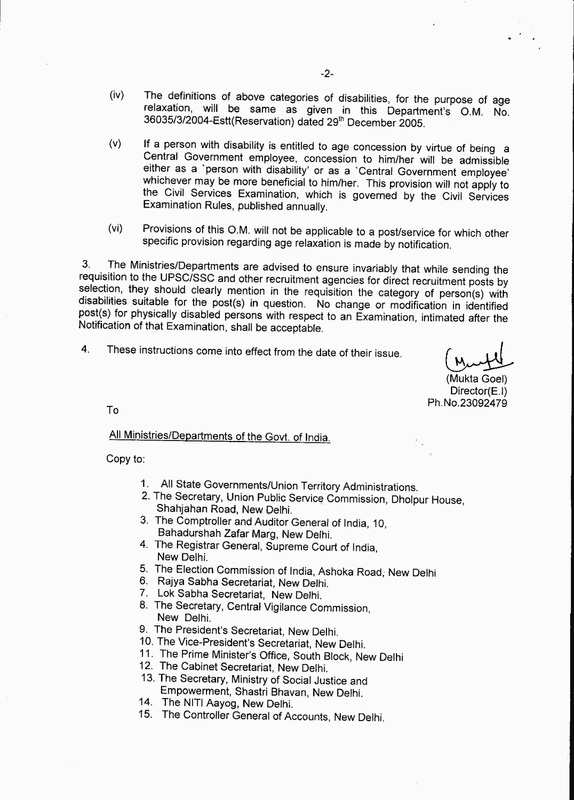 (i) Parity in the pay scales between the personnel in the Central Sectt and those in the subordinate establishments. 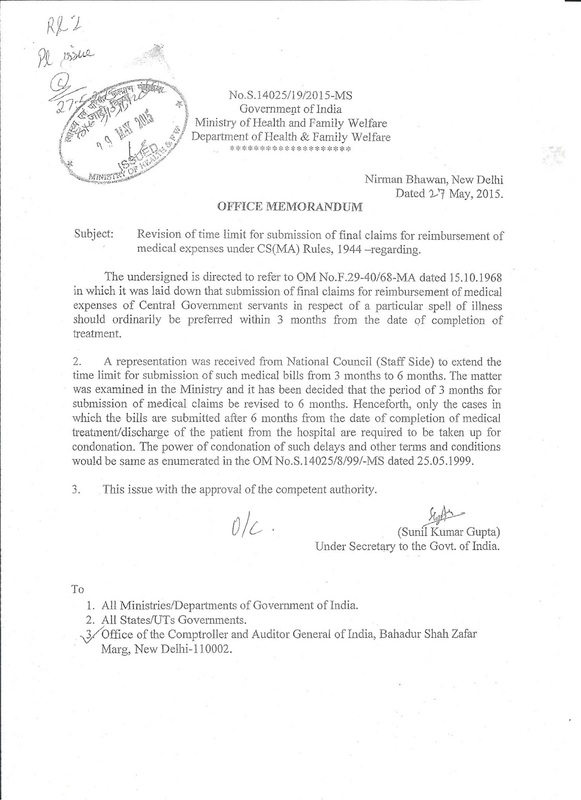 The Commission stated that they have appreciated the stand taken by the Staff Side in the matter. The Commission was non committal on other issues raised by the Staff Side members. The Official side stated that the Action taken Statement was almost ready but for certain comments from Certain departments. The same would be sent to the staff Side and another meeting held to discuss the course of action required on items where no agreement could be reached. The JS (per) stated that some of the references received from the Railways had been sent back to them for clarification before a final decision is taken. Regarding increase in the rebate ceiling under the Income tax Act, the matter would be referred to the revenue department and requested the staff side to appreciate that the same has to be considered in a wider perspective. Thereafter the agenda items, which had not been discussed even once were taken up. (ii) Anomaly in the Pay Band and Grade Pay assigned to the Group B Officers of the Audit and Accounts, Incometax, , Central Excise and Customs and Postal Departments. (Agenda Item No. 1 and 8 taken together.) Despite agreeing that there existed an anomaly in the matter, the official side expressed their inability to proceed further in the matter as the Group B Gazetted Officers were beyond the ambit of the JCM scheme. However, they agreed that the Govt. would take up the issue specifically with the 7th CPC. Com.Shiv Gopal Mishra said that the Govt. must consider a JCM set up for the promote officers as their cases are not heard or discussed at any other forum. Com. Kutty said that the items were introduced as early as in 2009 and it was not correct on the part of the official sided to state that the same would be referred to the 7th CPC. Normally the Pay Commission would not entertain to consider the anomalies of the earlier Commissions. However, after some discussions, it was agreed that they would discuss the issue of audit & accounts scale (AAOs) separately after receiving a note from Staff Side and in respect of others, a note will be submitted to the 7thCPC. (iii) Anomaly in the pay and Grade Pay of Data Processing Assistants Grade A.. The official side did not agree with the contention that the assigning of higher grade pay to certain categories of officers (7450-11500 and Grade Pay4600) was arbitrary. The Government, they added, had acted upon the recommendation of the 6th CPC. They also said that only in those cases where the pre-revised pay scales were in 6500-10500 such up-gradation had been made. In the case of DPA Grade A, they were in the pre revised scale of pay of Rs. 5500-9000. (iv) Item No.3. Grant of Grade pay of Rs. 4200 to Lab Technicians. The official side said that the orders have been issued in the matter. (v) Item No.4. Up-gradation of Pay Band and Grade pay of LDCs and UDCs. (vi) Item No.5. 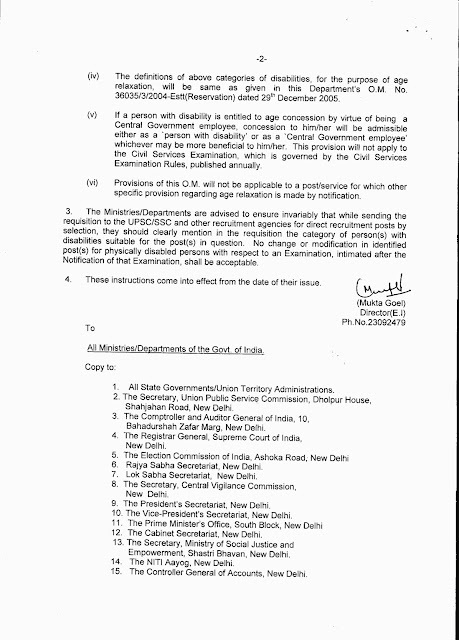 Senior Clerks in DMS to be assigned grade pay of Rs. 4200. The matter was stated to be sub-judice. (vii) Item No. 6 and 12. - Removal of anomaly in the case of artisans staff of different departments & Master Craftsmen pay scale in MMS in Postal Department The two agenda items being identical were take up together. The Staff side pointed out the glaring discrimination in the matter. They also stated that the number of employees involved is very small. On behalf of the Postal Department it was stated that the recruitment qualification in the Postal Department was VIII Standard and ITI whereas in other establishment, the academic qualification stipulated was X Standard. The Staff side contested the same pointing out that no person is entitled to be admitted to ITI without having X standard qualification. They pointed out that the merger of Artisan Grade I and Charge hand was the root cause of the problem. The official side took the stand that in any case the anomaly cannot be removed at this stage and have to wait till the 7th CPC recommendations are made. (viii) Item No. 7. Parity in pay scales between the Central Sectt. and subordinate offices. The official side said that the up-gradation of the pay scale of Central Sectt. Assistants were on well found grounds. The Government had considered the repercussion of the said decision and therefore, the decision is not possible to be either reversed or extended to any other category of employees. 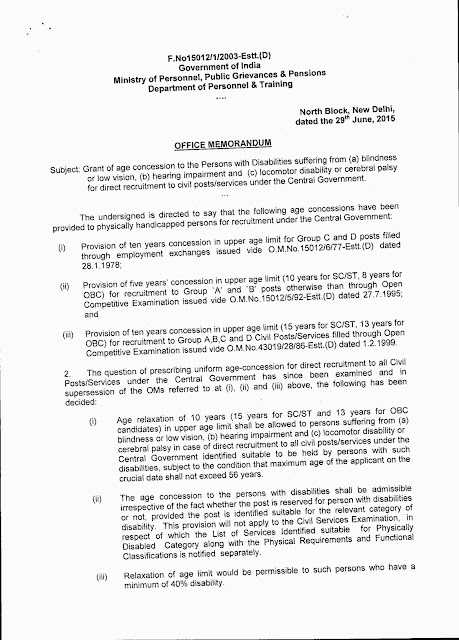 They added that perhaps the 7th CPC before whom the matter is already agitated by the employees organizations of the subordinate offices might take a decision in the matter. (ix) Item No. 9 and 10. Higher grade pay for Medical Assistants and Store keepers. 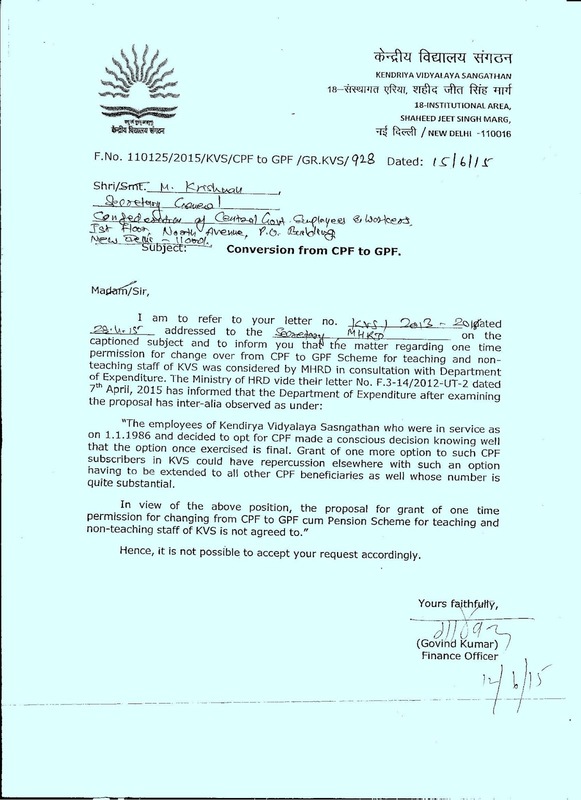 The Defence Ministry was asked to submit a detailed note to the Ministry of Finance indicating the duties and responsibilities assigned as also the recruitment qualifications stipulated in the RR to enable them to reconsider the issue. (x) Children Educational Allowance for any two children. The official side stated that the deviation made in identifying the eldest two children was consciously done taking into account the National Population policy and various other factors and is not likely to be changed. Regarding the claim for reimbursement of expenses incurred in the nursery class, as such institutions or classes are not linked to any Educational Boards, the official side said that they would look into the matter with a view to find a solution thereof. National JCA meeting on 8th June. It was informed at the house that both Defence and Railways would be taking their strike ballot and would be concluded in the first week of October. The meeting decided to advise the other units to chalk out progammes of action in July so that an ambience of struggle could be created. The NJCA also took note of the painful fact that despite assurances, Government was not convening the Departmental Councils and the JCM has been allowed to become defunct. The National JCA in conclusion decided to appeal to all affiliates to take concrete steps to invigorate the joint movement of the Central Government employees and meet the challenge that is like to arise on receipt of the recommendations of the 7th CPC.by creating an atmosphere of Unity, and determination to carry out the call of indefinite strike action scheduled to commence on 23rd November, 2015..
An urgent meeting of the National Executive of the Confederation of Central Govt. Employees & Workers will be held at ITEF Head Quarters (Rajouri Garden), New Delhi on 12-07-2015 (12th July 2015 - Sunday). The meeting shall commence at 10.30am and continue till close. National Secretariat members, Chief Executives of the affiliated Organizations, General Secretaries of all State level C-o-Cs and main Office bearers of the Women's Sub Committee are requested to attend the meeting. 2. One day General Strike on 2nd September 2015 as per the call of Central Trade Unions. 3. 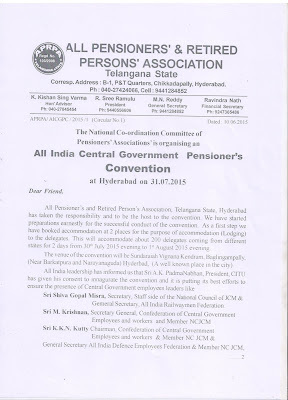 All India Women's Workshop of Confederation - Hyderabad - Finalization of dates etc,. 4. Finalization of the venue of the next All India Conference of the Confederation to be held in 2016. 7. Any other item with permission of the Chair.